Bold, clean lines and contemporary comfort mark the Lafitte Collection by Lakeview Outdoor Designs. Hand-woven wicker in Tawny Ash is interlaced around extruded aluminum. The champagne powder coat is sealed with a clear finish to prolong the life of the furniture. High-performance Sunbrella fabric envelops wrapped foam, 2-inch thick cushions, providing fade-resistant, water-resistant and stylishly comfortable seating. The 6 person, sleek and strong table features a slat table top that creates an all-weather dining surface. Paired with six swivel rockers, this set encourages dining with modernity. 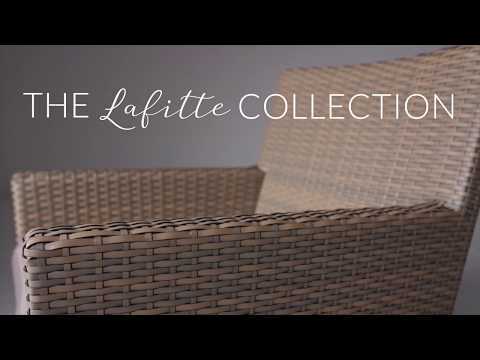 With accents of taupe and beige throughout, the Lafitte Collection will blend harmoniously with any outdoor setting. Adjustable leveling feet allow ideal placement, providing improved stability on uneven outdoor surfaces. Dimensions (in inches): Slat Table: 86 5/8 W X 39 3/8 D X 29 1/8 H. Swivel Rockers: 22 3/8 W X 25 5/8 D X 32 11/16 H. Seat Height: 15 3/4 Inches. Arm Height: 24 3/16 Inches. Included assembly hardware is made with stainless steel components for outdoor use. Table Size 87 5/8 X 39 3/8"
15 3/4" 15 3/4" 18" 17 1/2"
87 5/8 X 39 3/8" 87 5/8 X 39 3/8" 48 X 48" 72 X 42"
29 1/8" 29 1/8" 29" 29"
24 3/16" 24 3/16" 25 3/8" 25 1/2"